The combination of a large capacity engine in a relatively small car is nothing new. And there’s nothing particularly sophisticated about this engineering approach but, nonetheless, it’s the route Mazda has taken with the go-fast SP23 version of its popular Mazda3. 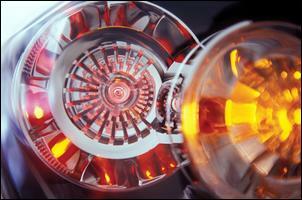 You won’t find a turbo or rotary engine here! 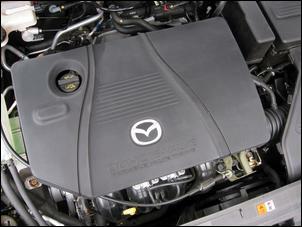 While lesser Mazda3 models use a 2-litre in-line four, the SP23 is equipped with the larger 2.3-litre engine as fitted to the Mazda6. The 2.3-litre engine boasts Sequential Valve Timing (SVT) on the inlet camshaft, 16-valve breathing and a 9.7:1 compression ratio. In SP23 guise, the 2.3 litre engine is tuned to deliver 115kW and 203Nm at 6500 and 4500 rpm respectively – 7kW and 4Nm less than the Mazda6 version. With a 2.3-litre engine pumping between the front wheels, the Mazda3 SP23 offers sharp throttle response (at least in manual guise), excellent tractability and smooth torque delivery. But it’s not the outright speed machine that it’s hyped up to be. With 1232kg to shift, the 2.3-litre engine delivers spritely performance – but nothing more. We recorded 9.0 seconds 0 – 100 km/h, which is slightly slower than Mazda’s claim of "about" 8.5 seconds. The SP23’s 2.3 litre engine is tuned to run on normal unleaded fuel and we recorded 9.8 litres per 100km average consumption during our test. This is pretty typical for a 2.3-litre engine in a car of this size. Interestingly, Mazda states that using premium unleaded fuel will increase power beyond the quoted 115kW output - but we didn’t notice (or measure) any on-road difference between ULP and PULP. The standard gearbox for the SP23 is a 5-speed manual – there’s no 6-speed, which you might expect given the car’s sporty appeal. Fortunately, the 5-speed ‘box has a good selection of ratios and a sporty gearshift. So how capably does this smallish hatchback manage the grunt of a big cube engine? With drive to the front wheels (without an LSD), the SP23 has slight torque steer when accelerating hard from low speed and you can provoke a considerable amount of inside front wheelspin in tight cornering. It’s also possible to induce axle tramp – especially when driving on a wet road. Traction control would certainly be a welcome addition. 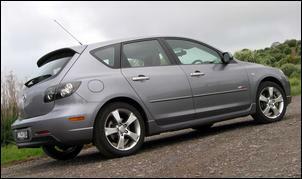 But aside from these power-down issues, the Mazda3 SP23 is a rewarding car to drive. The electro-hydraulic steering is very direct and well weighted, which helps give the car a wonderfully precise feel. The suspension is also well tuned to deliver sharp turn-in and very neutral handling balance – it’s biased slightly towards understeer but it isn’t a pig-understeerer. Grip levels are high thanks to 205/50 17 Bridgestone Potenzas. With MacPherson struts at the front and a multi-link IRS (based on the design of the Mazda6), the SP23 has a firm but acceptable ride. Unfortunately, those grippy Bridgestone tyres are very noisy on coarse bitumen. The brakes of the SP23 are also upgraded over lesser models. At the front are 300mm ventilated discs while the rear uses 280mm solid discs. ABS, EBD and Brake Assist come standard but it is still possible to generate a yaw moment under heavy braking. The SP23’s sporty feel combines well with its up-to-the-minute interior and body styling. The SP23 cabin feels very much like an Alfa Romeo – there are plenty of curves, different surface textures and a bold layout. But it does go a bit too far. The otherwise clear instruments are difficult to see when wearing sunglasses, the centre console controls aren’t intuitive and some of the ‘whiz-bang’ interior lighting techniques had us rolling our eyes. The lack of vanity mirror illumination and a remote hatch release are also strange. 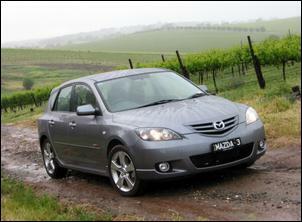 The Mazda3 has seating for five occupants but it performs much better as a four seater. 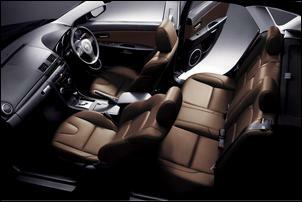 Rear passengers enjoy plenty of headroom while foot and knee room is fine when the front seats aren't fully slid back. The rear cargo area is big enough to fit a sizeable load without resorting to folding the 60/40 split rear backrests. Folding the rear backrests is an easy operation, except the rear seatbelts can get tangled during the process. Beneath the cargo area floor is a handy plastic tray and beneath the tray you’ll find the space saver spare wheel. The SP23 is reasonably well equipped with goodies such as stainless steel scuff plates, climate control, a leather steering wheel and gear knob, ambient temperature display, carbon-look trim, 6-disc in-dash CD stacker (with steering wheel controls) and six airbags as standard. You’ll need to pay an extra AUD$572 for cruise control, while electric seats and a trip computer are not offered. Our test car was fitted with Mazda’s optional leather pack, which adds leather seats and door trims together with a punchy 220W Bose speaker system, high-gloss 17 inch wheels and door handles. This pack adds AUD$2760 to the SP23’s base price. 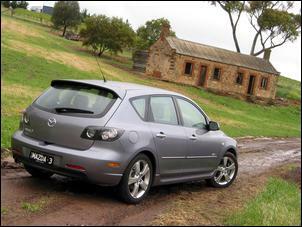 Like the cabin, the Mazda3 body is styled for maximum contemporary appeal. Each panel of the five-door hatch is heavily sculpted and the SP23 comes with a body kit, front fog lights, unique LED taillights (which aren’t easily seen in some light conditions) and 17 inch alloys. A conservative looking SP23 sedan is also available at the same price as the hatch. The build quality of our test car was good in most areas, but there was a horrible thumping noise when operating the driver’s electric window and an occasional high rpm whine from the engine’s balance shaft. Aside from this, the panel gaps were tight and consistent and the paint was well finished. A 3 year/100,000km warranty is provided. The base SP23 5-speed retails at AUD$29,220 but, as tested (with the optional leather pack), you’re looking at AUD$31,980. Thirty-plus grand is a lot to pay for a four-cylinder Japanese hatchback, but it does compare well with its nearest rivals - the Toyota Corolla Sportivo, Volkswagen Golf FSI and Pug 307 XSi. The Mazda3 SP23 isn’t a car that’ll knock your socks off in terms of sheer performance, but its responsiveness, handling balance, steering precision and styling will make it very attractive to hot hatch buyers.